Are you experiencing pain while going through your daily routine? Is the pain coming from your toes? Well, you might be suffering from a neuroma. A neuroma could also be referred to as a pinched nerve, or even a nerve tumor. They are benign growths of nerve tissue, that most commonly act up while you’re walking. You could experience a burning sensation, tingling, or even numbness between your toes while doing daily activities. Most people suffering from a neuroma find relief when they take a break, remove their shoes, or even rub the area that’s giving them pain. While that seems like a simple fix, it can get repetitive to continue disrupting your routine like this. So why not visit a podiatrist in Bellmore to get rid of this problem completely? 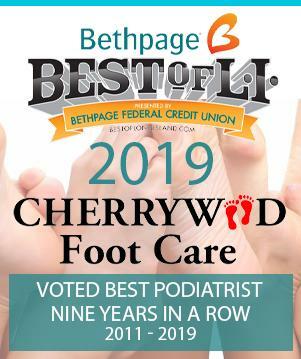 At Cherrywood Foot Care, Dr. Joseph Burke and his team of doctors in Merrick, Bellmore, East Meadow, and Wantagh are equipped to treat your neuroma with the most up-to-date and cutting-edge technology available. Having pain in the ball of your foot when putting weight and/or pressure on it. How can a podiatrist in Bellmore treat my neuromas? Padding and taping to change any abnormal foot functions that could be causing the neuroma. You shouldn’t let neuromas affect your everyday life. If you’re someone who is suffering from a neuroma it may be time to call a podiatrist in Bellmore. Making an appointment with Cherrywood Foot Care is simple. Check out our new patient registration online to get ahead of the game before you come into one of our offices.